Diamond is pure carbon, with an isometric crystalline structure. Standing at 10 on the Mohs’ scale, it is the hardest substance known. 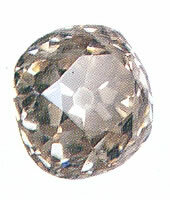 Diamond has a high ability to bend light (refraction) and to disperse light into its component colors. These properties are best brought out when the stone is cut and faceted. Diamond purifies the will and encourages living according to the code of ethics that says to treat others as you would wish to be treated. It brings all around prosperity.